Humour and horror go hand-in-claw, especially true in the world of scary books aimed at kids. And it stands to sense, given that humour cuts tension, brings levity and lightens what could otherwise be gruesome fare for young readers. 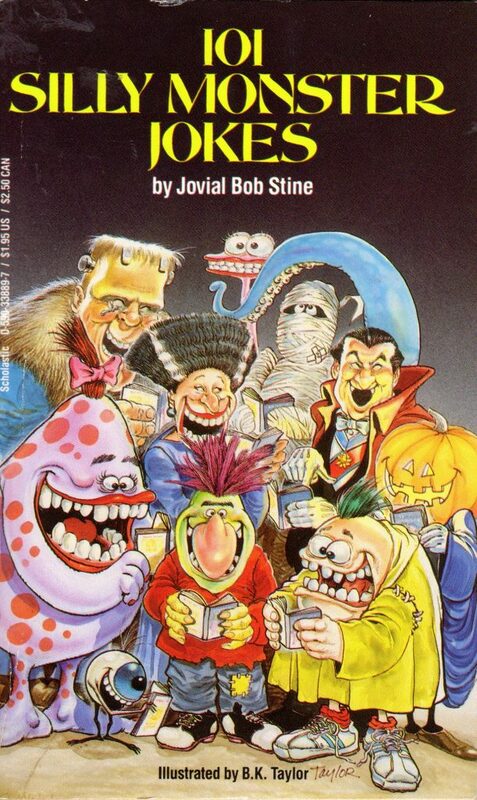 That might explain why countless monster and horror themed joke books aimed at kids have appeared over the years, but I would argue that the most interesting in this frightfully funny subset is 101 SILLY MONSTER JOKES, written by Jovial Bob Stine and published by Scholastic in 1986. Stine, of course, went on to become the children’s fiction equivalent of Stephen King. As R.L. Stine, he worked primarily in children’s humour before venturing into children’s horror. That’s not to say that he lost his funny bone; jokes abounds in Stine’s scary works for kids, and 101 SILLY MONSTER JOKES is a valuable early insight into his unique brand of humour. Q: Why did Frankenstein stick his finger in the electrical socket? Q: How do you make a monster stew? 101 SILLY MONSTER JOKES makes a perfect companion to HOW TO PREVENT MONSTER ATTACKS by Dave Ross (which I covered earlier in this column) and can easily be found online for as little as 94 cents (I found mine at a library book sale for a quarter!). If you have a young one who likes to laugh, or if you count yourself a fan of monster mirth, do yourself a favour and get this book for your collection. It’s fang-tastic.